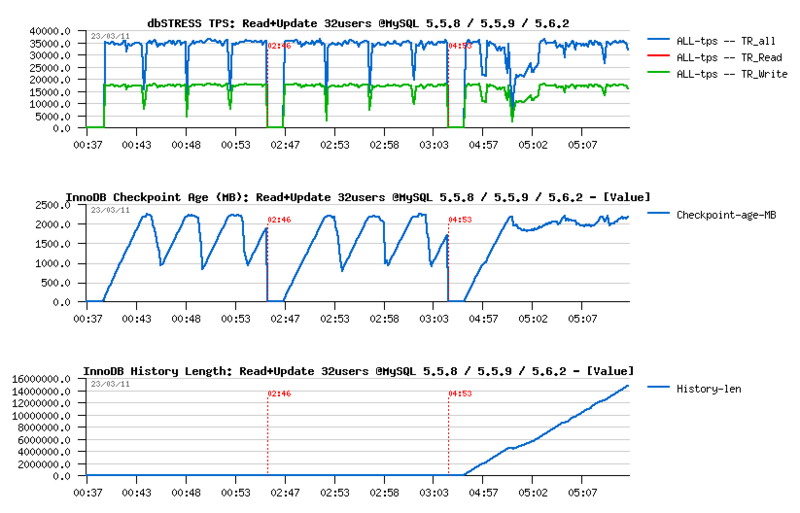 DimitriK's (dim) Weblog : MySQL Performance: 5.6 Notes, part 3 - More in depth..
MySQL Performance: 5.6 Notes, part 3 - More in depth.. 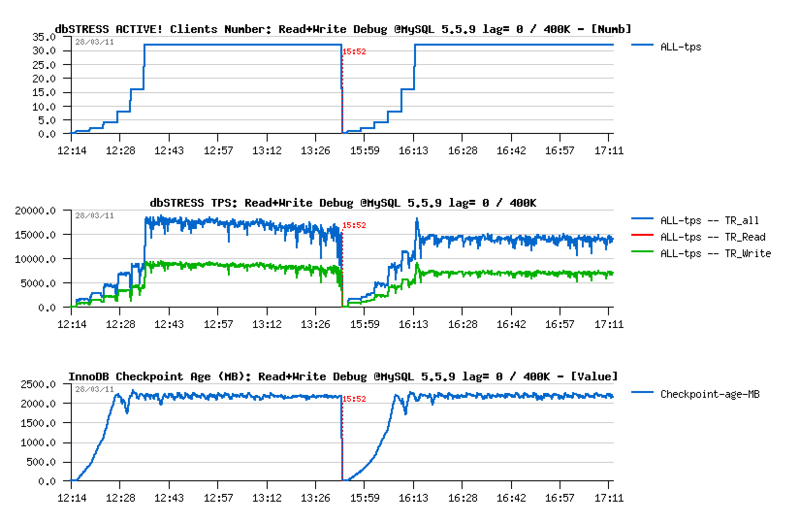 This is the third part of the MySQL 5.6 Performance Notes started from here. TPS: should remain stable too, no "furious flushing"
History Length: should remain low (or zero), and in any case should not grow!.. 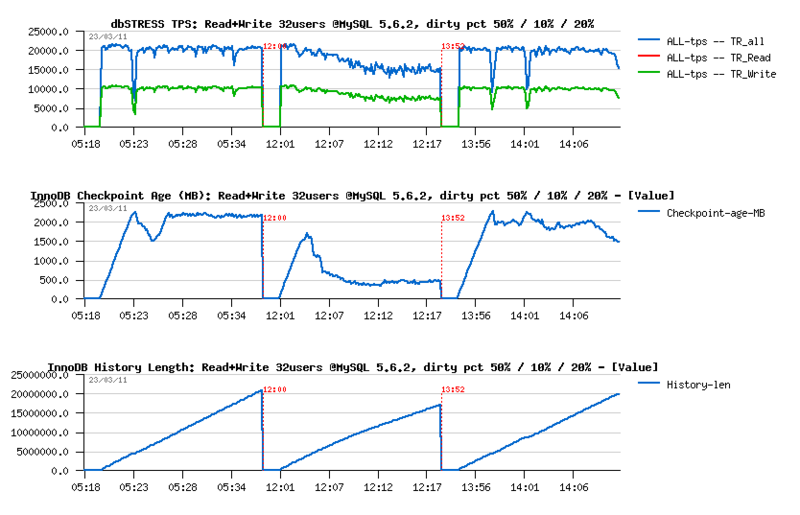 MySQL 5.5 has constant periodic performance drops due a "furious flushing", while MySQL 5.6 has these drops only on the beginning (but much more severe, and this severity is amplified by the presence of contention on the "log_sys" mutex..) - once it's passed, performance on 5.6 is looking more stable..
Only 5.6 have a History Length growing here.. - not good at all..
TPS level looks the same on all engines, but results on 5.6 may be different due a lower purging.. 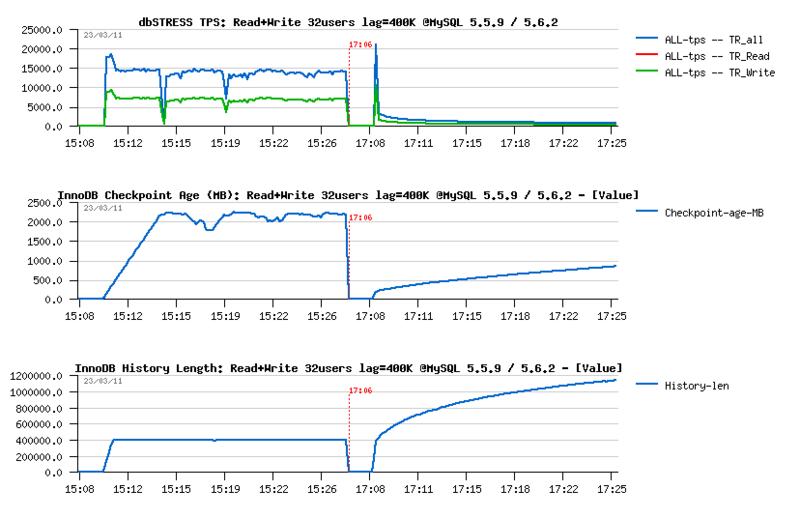 NOTE: using 2 or 4 purge threads in MySQL 5.6 did not change absolutely nothing..
both MySQL 5.5 and 5.6 having a performance drop on the beginning, this drop is less seen in 5.5.8 comparing to others..
TPS level in 5.6 is higher comparing to others, but it's probably just due a lower purging.. So, my current dirty pages percentage setting is 50%. What if I'll set it now to 10%? then 20%?.. 10% is probably too much..
10% - is really too much, even performance become worse..
20% - not better either.. NOTE: History Length continues to grow within all tests, not good..
increase redo log files way more (but it'll be possible only since next 5.6 version)..
well, for the moment lowering dirty pages percentage is looking as more optimal..
Ok, so far and what about this growing History Length?.. - it's looking like we have an issue with a purge processing..
Having purge thread enabled did not help..
Having 2 purge threads did not help too..
Having 4 purge threads did not help either.. So, there is a problem for sure.. And the only solution may help here is to use a "max purge lag" setting. But to make it working a little hacking is needed in the code - just to comment out the check for a presence of consistent read when the max purge lag condition is verified, otherwise it'll be never involved.. (BUG #60776 (http://bugs.mysql.com/bug.php?id=60776)). The idea of this feature is to delay DML statements for some milliseconds if the purging is not fast enough and cannot follow the workload activity (and bigger the lag is, a bigger delay will be used (calculated dynamically)).. 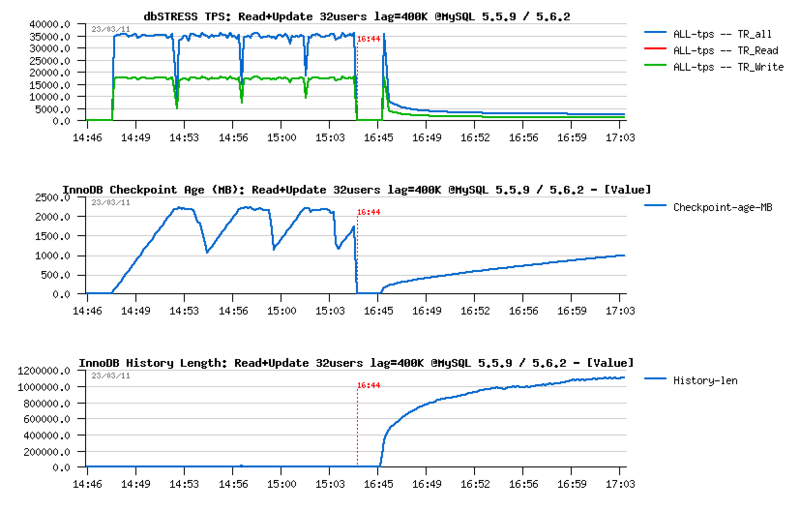 I've "fixed" both MySQL 5.5.9 and 5.6.2 versions, and let's see now what is the result (in all following test I've used innodb_max_purge_lag=400000 (400K is quite big enough "normally", at least it's what I've used before in the previous tests in the past).. 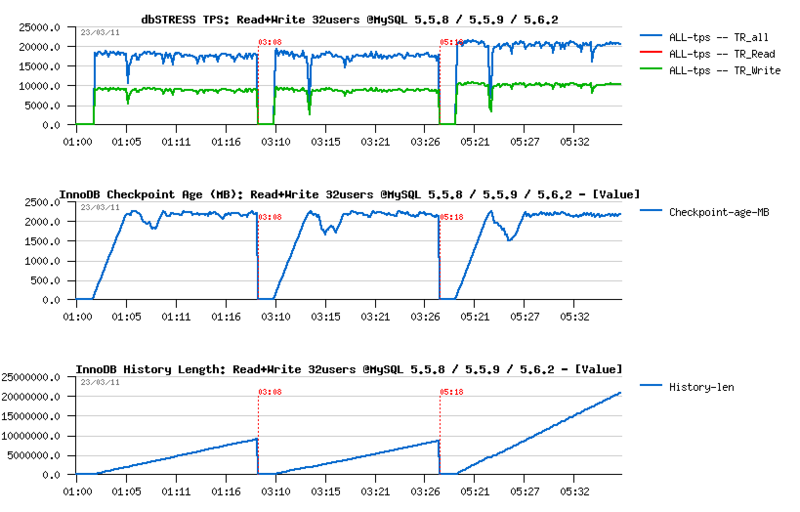 However, there is a real problem with 5.6.2 - History Length still out-passing 400K, and performance is dramatically dropped..
For MySQL 5.6.2 things are much worse again.. - TPS is x20 times lower and purge lag still continue to grow.. 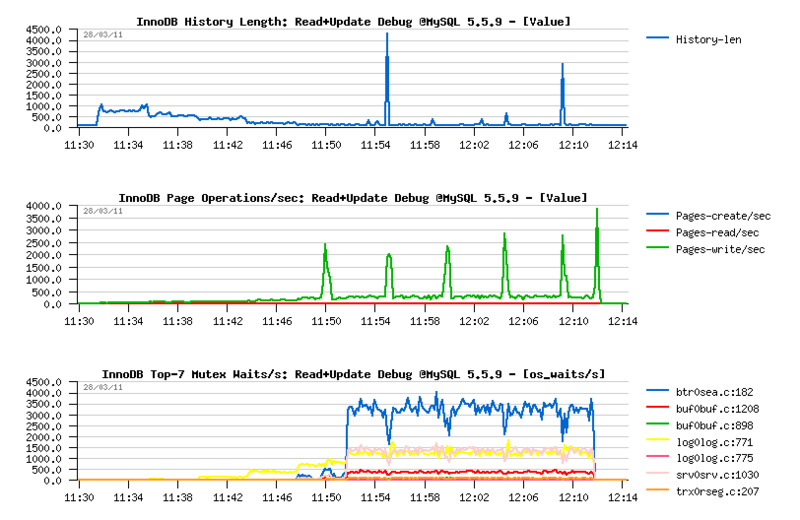 Seems more investigation is needed on the purge implementation within MySQL 5.6. There is a real problem here..
Also, in parallel, I've discovered that there may be some background effects due a data blocks moving when I'm testing 5.6 after 5.5 tests (as well it may be just a simple "feeling" without any objective reason :-)) - but anyway, all the following "debug" tests were executed on the freshly restored database from a zero state backup..
Let's get a look on the MSQL 5.5.9 performance first. Number of concurrent users (Clients) is growing progressively from 1, 2, ... to 32, and TPS level continue to grow too..
TPS drops are perfectly corresponding to the Checkpoint Age drops when we reaching a critical amount of REDO free space and the "furious" flushing is involved then.. - seems these drops are not having a bigger depth just because my storage is fast enough here..
Adaptive FLushing is not looking here to be really adaptive.. - even on 16 users it already got its first performance drop.. - need a fix for sure! History Length remains very low and quite stable, so purge is working well.. NOTE: once again "btr_search_latch" is present.. - while on this workload UPDATE is executed in place and not changing any indexed field.. - so the contention is coming mainly from the reads (as on the Read-Only workloads before), and once again all the data are already cached within a buffer pool, and there is no more page reads during this workload.. 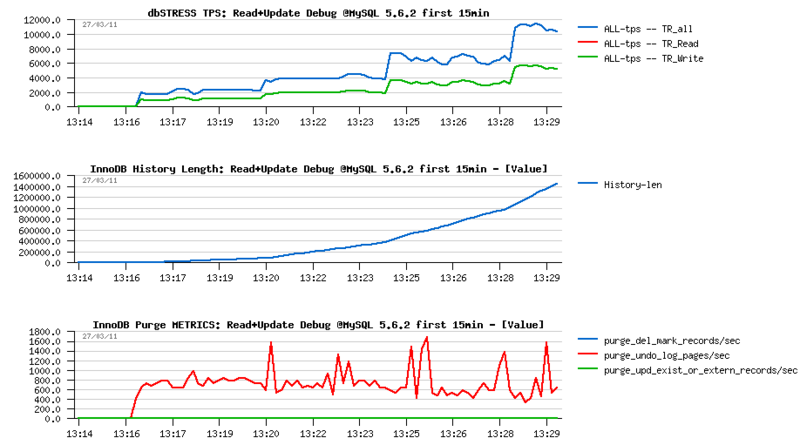 Except the adaptive flushing issue, Read+UPDATE workload still looks fine on MySQL 5.5.9.
the second one - with max purge lag = 400K (innodb_max_purge_lag=400000), NOTE: you'll need a fix applied from the (#BUG) to get purge lag DML delay working properly..
Adaptive flushing is still not optimal here, but the TPS drops shorter in depth..
With a max purge lag=0 the max TPS level is higher, however it's not stable and continuing to decrease over a time from 18.000 to 16.000 TPS.. (interesting that on the "previous" server last year I've obtained 20.000 TPS on 32 users on the same workload)..
Then having max purge lag=400K gives a lover performance - 14.000 TPS, but more stable result as there was no TPS degradation over a testing period (1 hour for 32 users)..
History Length remains stable on 400K during the second test, which is reducing overall work around pages operations.. Page writes are lower and not growing in the second case too (so a flushing should be also more stable).. Interesting that the Mutex Waits pictures are also looking different: while contentions on buffer pool mutex and index mutex are presented in both cases, the second configuration is avoiding a growing contention on the kernel_mutex..
And what about MySQL 5.6 now?.. Then the Third, and very negative surprise - Purge is looking like completely "absent"..
History Length is constantly growing.. 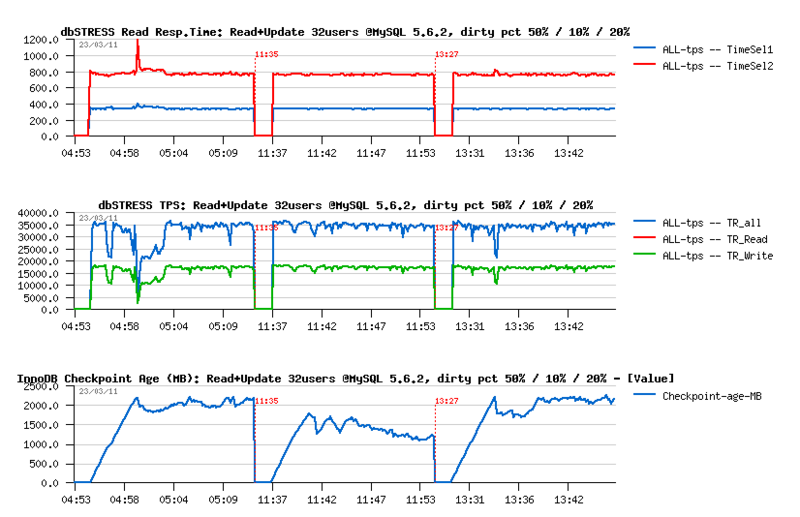 Pages are manly purged at the end, once the workload is finished..
the "kernel_mutex" waits are no more present now..
and interesting that "btr_search_latch" mutex contention is finally arriving here on the top position too..
the only one thing is positive that TPS level looks higher than on 5.5.9, but it's very possible that it's just due a non purging..
then TPS drops are well present..
adaptive flushing is well active, but seems simply to not flush enough..
"async" flushing is involved every time when the free REDO space reached a critical level..
note that there were several "async" calls to reduce the Checkpoint Age..
interesting that there was no one "sync" call over all the test duration..
the top wait is a buffer pool "block mutex"
So far, if with Adaptive Flushing it's clear that in some cases it's simply not flushing enough and it should be just improved... - then regarding Purge there is something really going wrong and I have to get a look on it more closely.. It gives an "impression" to be "absent", but what kind of Purge activity we have on a single session?.. - still "absent"?.. on 2 sessions?.. 4?.. As you see, History Length is growing from the beginning, even with a one single session! 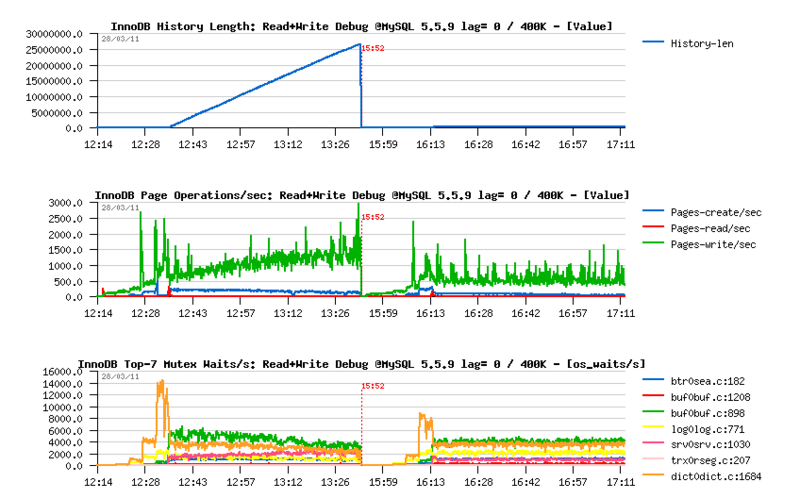 However, the amount of purged pages/sec remaining the same even on 1, 2, 4 or 8 concurrent sessions!.. 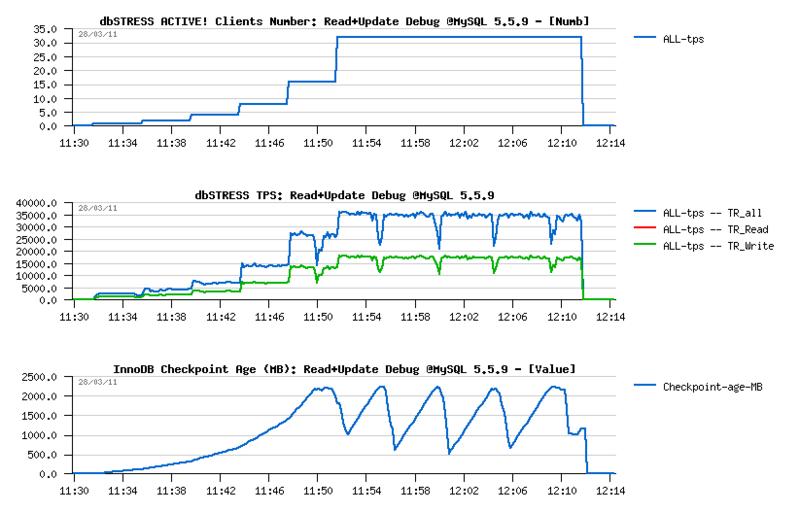 There is a problem on "Purge related" code for sure..
Don't think that this problem is related to dbSTRESS workload as on this test there are a simple series of SELECTs and UPDATEs, nothing special.. Will be interesting to see if the picture is the same on "sysbench" too.. The feature is really great as it's very easy to configure and request. I've finally enabled all counters as I did not observe any performance impact during my tests. Note: there is a negative value in "buffer_pool_pages_in_flush", should be a bug? in many cases it makes sense to know not only the "current" / "last" counter value, but also a "total" (ex. flushed pages: it's fine to have the latest value, but without a "total" it's hard to follow the flushing activity as we're not always flushing the same amount of pages per flush call, etc.).. in some cases it makes sense also to present not only a number of times when the action was involved, but also a number of involved calls (for ex. we may call a flush more often than it's really involved (just because there is a batch in progress), but it'll be a direct sign that we're not flushing according to demand, etc. - same with purging, and probably others)..